The New Moon at 20+ degrees of Cancer is a partial solar eclipse. 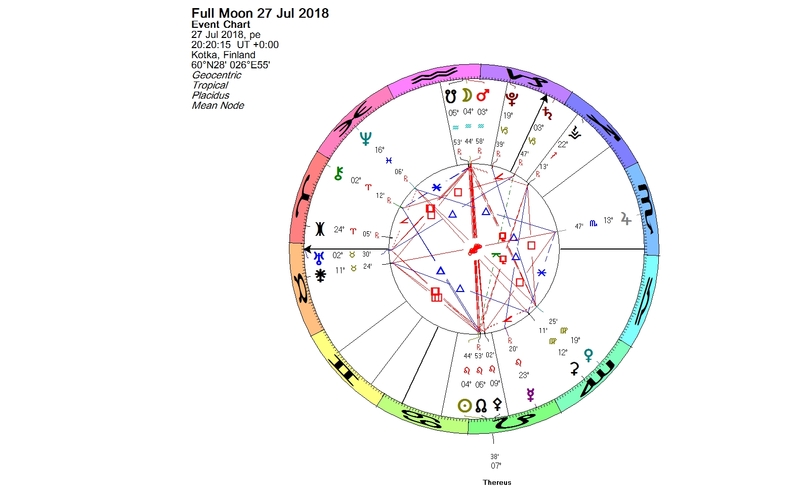 The Moon covers only part of the Sun, but anyhow, this is an intense eclipse, because it takes place exactly opposite Pluto. Right after the eclipse, on July 16, 2018, President Trump and President Putin will meet at the Helsinki summit. This is the first official meeting between these two world leaders. The Sabian symbol for the eclipse degree is Cancer 21 “A prima donna singing”. Perhaps we are going to see two of them. Astrology is dualistic in its nature. Pluto’s polarity was clearly perceived soon after its discovery, long before its double companion Charon was found. Pluto is a planet of power. Along with its purging quality and tremendous ability to propel spiritual growth and renewal, also tendencies for control and manipulation belong in its dominion. 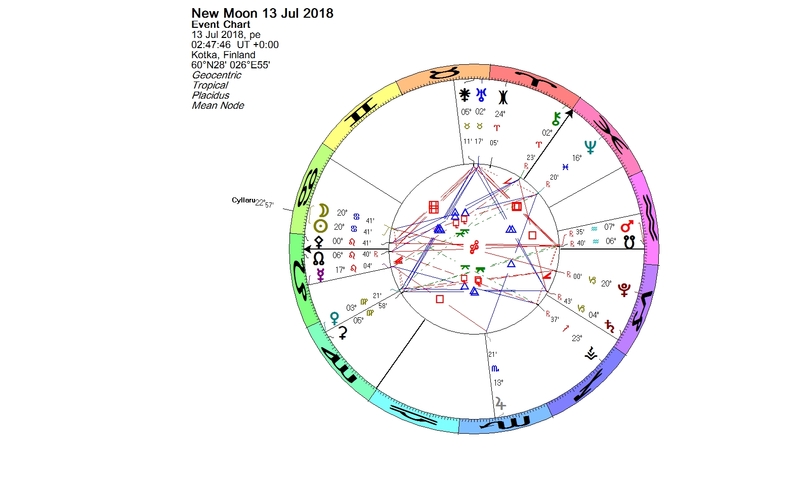 The eclipse takes effect opposite Pluto. An opposition aspect can raise awareness or increase the possibility of a conflict. Pluto is associated with places underground. Among other things, sewers belong to his symbolism. Pluto operates invisibly, and when the time is ripe, he brings the secrets into daylight. I was amused reading that sewer covers are being welded shut in Helsinki for the next week’s summit meeting as a security procedure. I don’t think that it is going to prevent Pluto! This solar eclipse occurs in conjunction with 52975 Cyllarus, a centaur planet discovered almost 20 years ago by American amateur astronomer Nichole Danzl. The orbital period is over 133 years and the diameter is about 70 kilometers. 52975 Cyllarus was named after a young and beautiful centaur in Greek mythology. Cyllarus and Hylonome were like Romeo and Juliet. Cyllarus was severely wounded in a battle and died in the arms of his beloved. In her despair Hylonome killed herself by throwing herself onto the same javelin that had pierced her partner. Symbolically the centaurs represent shadow material in our consciousness. A death of a centaur can stand for a crisis in one’s life, which through awareness leads to change and growth. In the case of Cyllarus, what happens afterwards may gain more significance than the initial occurrence. Cyllarus is reminding us to be conscious of the choices we are making in our lives. The decisions we make directly affect not just us but also other people around us. You are currently browsing the Lunations by Kirsti Melto weblog archives for July, 2018.